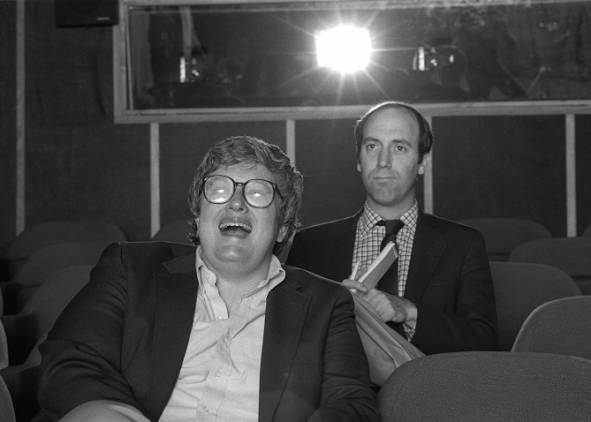 Roger Ebert and Gene Siskel. Courtesy of AP. It is the opportunity of a lifetime, and I am honored to accept it. Today, I’m officially announcing my new position as Assistant Editor at Ebert Publishing. I’ll be working with editor Chaz Ebert and project manager Dan Jackson to publish new books of reviews and other work written by the legendary film critic (and my lifelong hero) Roger Ebert. Our goal is to ensure that the voice of America’s most powerful pundit remains a vital part of the national discourse. There are few archives as bountiful, brilliant and gloriously entertaining as Roger’s, and its potential to continue generating essential books—both in print and digital form—is beyond measure. I was 12 when I bought my first Ebert book. It was the 1998 edition of “Roger Ebert’s Video Companion,” and the first review that caught my eye was his four-star rave for Warren Beatty’s live action comic book adaptation, one of the first movies that sparked my interest in how filmmakers create wholly new worlds through costumes, makeup, production design and visual effects. Roger’s writing captures the exhilaration that I felt when I watched the film’s opening credit sequence, as Beatty introduces viewers to Tracy’s heightened universe. Roger has introduced more moviegoers to classic masterpieces, from silent landmarks to foreign gems, than probably anyone in history. His “Great Movies” essays were at once richly insightful and deeply personal, enabling readers to share in the sensations he felt when he first had his cinematic epiphanies. One of the first things I did when I got a Netflix account was add all of Roger’s “Great Movies” selections to my queue, and one of my favorites was Carol Reed’s marvelously entertaining thriller with Joseph Cotten and Orson Welles. I first saw Roger in person a decade ago when I attended a special screening of Martin Scorsese’s 1967 debut feature, “Who’s That Knocking at My Door,” at the Chicago International Film Festival. I’ll never forget seeing his iconic silhouette materialize at the top of the stairs, watching as audiences filed into the auditorium. It was an evening I’ll never forget. Roger was one of Scorsese’s most vital and vocal champions throughout his entire career, and his excitement over the director’s crime epic on “Siskel & Ebert” is utterly infectious. Read Roger’s full “GoodFellas” review here. Nothing moved Roger more deeply than a character who decides to do the right thing, and nothing brought out the best in his writing than a filmmaker bound and determined to deliver the truth, even when audiences weren’t prepared to face it. While the Academy honored safe crowd-pleasers like “Driving Miss Daisy” and “Dead Poets Society,” Roger defiantly hailed Spike Lee’s fearlessly provocative game-changer as the year’s best film, rightly predicting that it would have far greater impact than the Oscar frontrunners. Here’s the film that I saw the day after Roger died. I spent the morning on State Street helping a small group of movie lovers gather condolences from pedestrians. The screening room was quiet and solemn. A flower had been placed on Roger’s vacant chair. As the film played, all I could ponder was the unthinkable thought that these were the last images he ever wrote about. Though I found the film impenetrable, his review (the last he filed) urged me to give it another look, challenging and inspiring me to the very end. For a full list of Roger’s reviews, visit RogerEbert.com.